The breadth of 3D printing material options is growing, bridging gaps between prototype and end-use production. 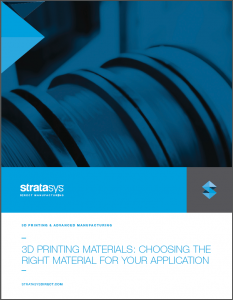 Machine manufacturers and third party materials developers have seen huge implications in the world of 3D printing and materials are evolving to reflect what engineers need. Read our white paper to navigate the material landscape among: Photopolymers, Powdered Plastics, Thermoplastics, and Metals.